CANopen is a communication protocol, based on the intelligent field bus(CAN bus). It was developed as a standardized embedded network with highly flexible configuration capabilities. It provides standardized communication objects for real-time data (Process Data Objects, PDO), configuration data (Service Data Objects, SDO), network management data (NMT message, and Error Control), and special functions (Time Stamp, Sync message, and Emergency message). 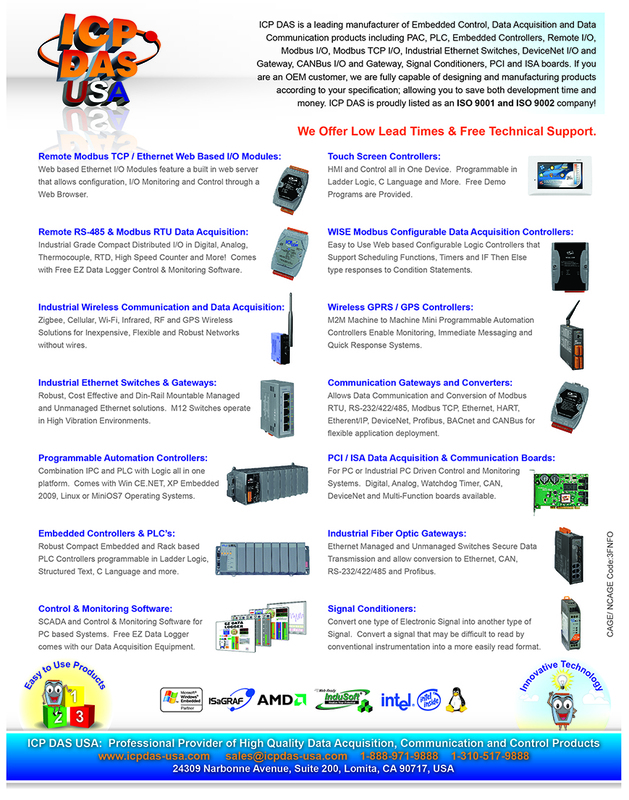 CANopen data acquisition is used in many different application fields, such as medical equipment, off-road vehicles, maritime electronics, public transportation, and building automation. 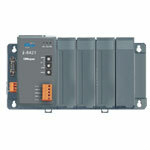 The I-8421 main control unit is designed for the slave device of CANopen protocol. It follows the CANopen Spec DS-301 V4.01 and DSP-401 V2.1, and supplies many features such as: dynamic PDO, EMCY object, error output value, SYNC cyclic and acyclic, … and etc. In order to expand I/O channel's flexiblity, an I-8421 supports up to 4 slots for I/O expansion and is suitable with a lot of ICPDAS DI/AI/DO/AO modules. Users can choose DI/DO/AI/AO modules of I-87K series or I-8000 series to fit the customized practice applications. In addition, we provide I-8421 Utilities to allow users to create the EDS file dynamically. The EDS file is based on CANopen DSP-306 and can be compatible with different CANopen master interfaces. The application architecture is displayed on the right. The I-8421 can automatically scan the I-8K/I-87K IO modules plugged in the main unit and assign these modules to a specific application. Before users apply the I-8x21 in CANopen applications, they must understand the relationship between these CANopen applications and the device object dictionary in I-8421. 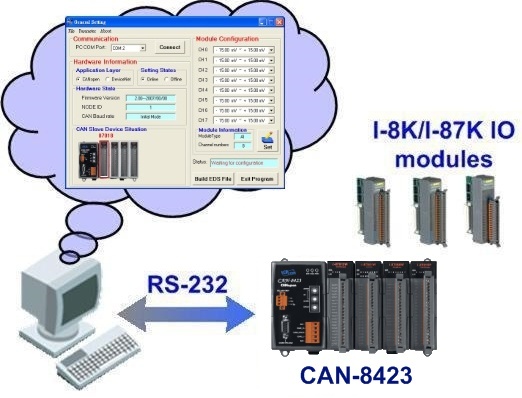 We provide the I-8421 Utility tool to allow users to make the configurations of AI/AO modules and some CANopen communication parameters; such as Rx and Tx PDO mapping, error control, and the device object dictionary. After finishing the Utility configuration, it the EDS file for the connected I-8421 device will be created. If the EDS file of the I-8421 is not needed for the application, users can use the default configuration for general DI/DO/AI/AO. Users only need to set the Node ID and baud by hardware rotary switch. After wire connections and the I-8x21 powered on, it can work normally on the CAN bus network through CANopen protocol. The following simple steps show how to use I-8KCPSx in CANopen protocol.